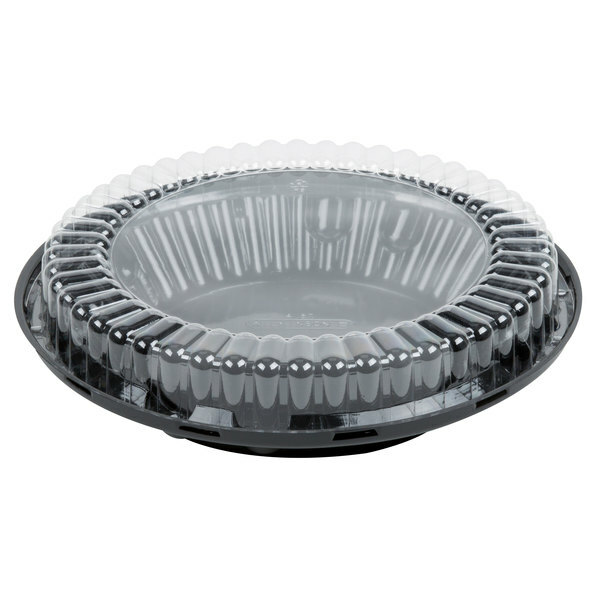 Show off your finest culinary creations and increase impulse buys with this D&W Fine Pack J44-1 10" pie display container with clear low dome lid. The container combines a durable, black polystyrene (OPS) plastic base with a clear 1 1/4" low dome lid to provide the best possible display for your delicious, freshly-baked goods. It is also resistant to water and oxygen, and therefore does not transmit exterior food odors to the food products inside. 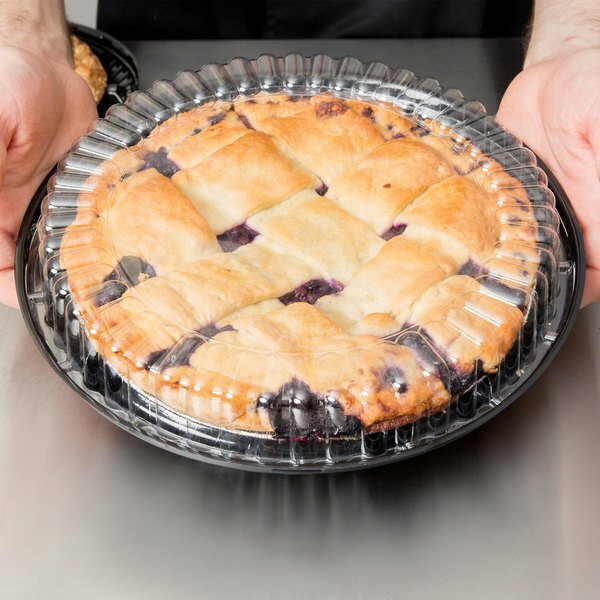 The tray will fit any disposable pie pan up to 9 5/8" in diameter. Designed with secure storage in mind, the lid snaps tightly and easily around the exterior. This closing style creates a seamless presentation that, unlike traditional tab locks, keeps the focus on your decadent pies. It also minimizes the amount of display space it encompasses, allowing you to store more containers in the same refrigerated space or dry bakery case. A ribbed exterior adds extra stability and, for extra convenience, it can be used in environments ranging in temperature from 20 to 180 degrees Fahrenheit, making it great for any chilled or room temperature display. 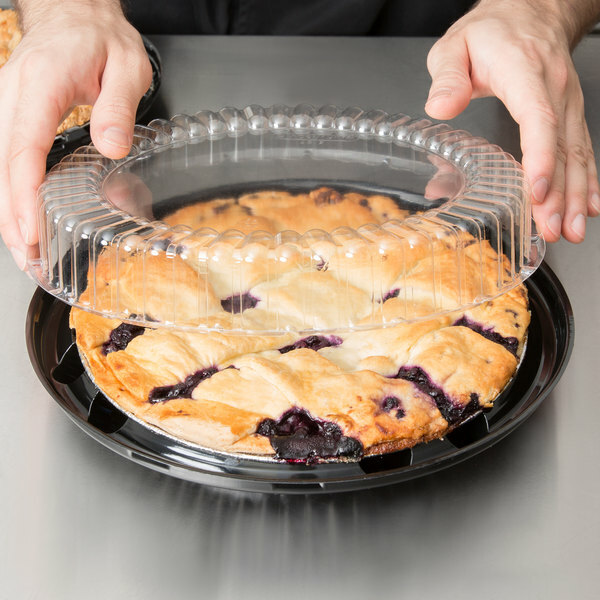 Plus, there's no need for customers to transfer pies to another container, as this versatile packaging is also perfect to display at picnics, parties, and catered events. 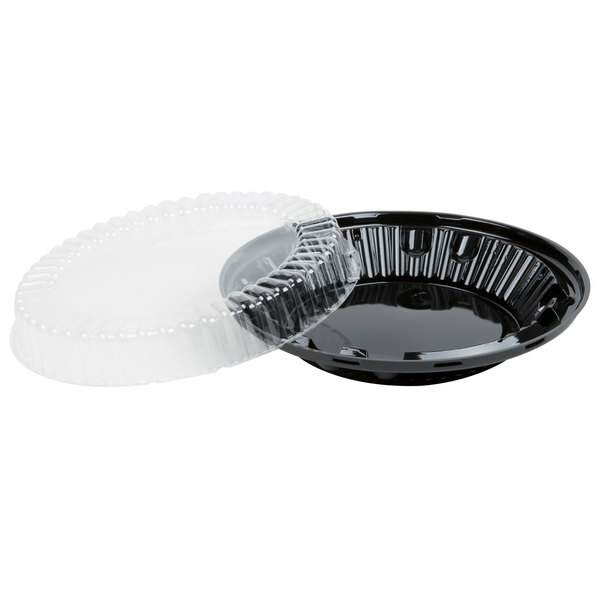 This is a great quality pie container and the lids are included, which makes it a great buy. I use these containers with lids to keep my holiday and everyday pies. The lids are not too high, but they are tall enough for meringue topped pies. It is so nice to keep a pie in this container rather than wrap it in plastic wrap that will stick to the top and be a mess. These are also nice for bake sales. They make a professional appearance. I always keep these handy. 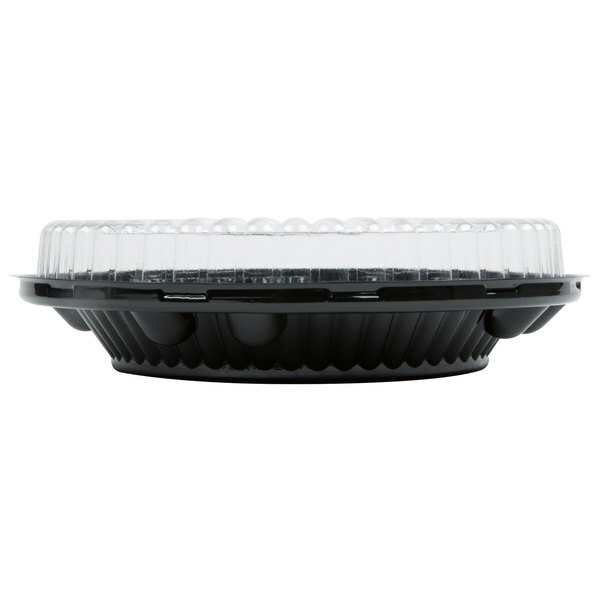 These are sturdy containers that really showcase our gluten-free pies. You may even be able to wash them out, sanitize and reuse at home too. Bought these just for the holiday use and can not stop using them! They are very spacious and so easy to use, perfect for almost every pie. These are great pie containers. They are very pretty and our stickers fits nice right in the center. The low dome is plenty high. I think the high domes would work best for cream pies. Great for pie sales. Top snaps on easily and the container is deep enough for any type of fruit or other pie. Easy to carry. Stores in the fridge and it's firm enough for stacking up to 4 pies high!